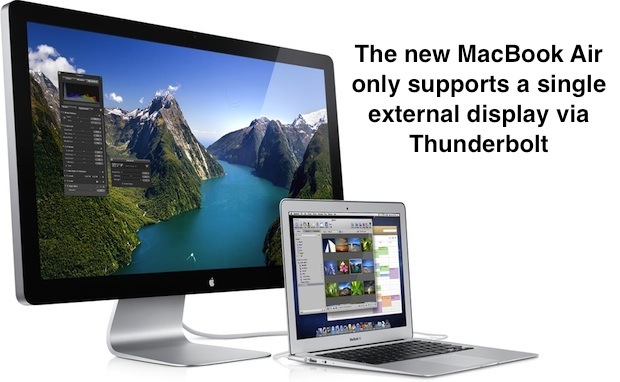 One of the more exciting features of the new MacBook Pro 15″ and 17″ and iMac series is that you can use dual external displays by daisy chaining them via the Thunderbolt port. Unfortunately, this ability is lost on the 2011 MacBook Air, due to the weaker Intel HD 3000 graphics chip and a stripped down Thunderbolt controller. Eagle Ridge is available in two form factors (normal and SFF) and is effectively half of a Light Ridge chip. That means you only get two Thunderbolt channels and one DP output. Apple used the small form factor version of Eagle Ridge in its new MacBook Air to cut cost and save on motherboard real estate. While this may affect some purchasing decisions and direct a few users to the MacBook Pro line instead, not all is lost. The 27″ Thunderbolt Display with it’s whopping 2560×1440 resolution is a giant on it’s own and should be more than adequate to meet the needs of most users looking for external displays with their MacBook Air. Plus, Apple is openly advertising the Thunderbolt display as a docking station of sorts for the MacBook Air, since it brings FireWire, three additional USB ports, Ethernet, and a FaceTime HD camera. And really, when we consider the heaviest MacBook Air is 2.9lbs and the benchmark performance is through the roof, can we really complain much? Big deal, it’s the new entry level portable Mac, you can’t expect it to do everything the Pro can do. Eeeeexactly. Who’s going to try and run two 27″ displays off a tiny laptop anyway? Running two huge displays is hardly even relevant for the MacBook Pro, let alone the featherweight of the range. Does this mean you cant daisy chain thunderbolt capable hard drives with a monitor? My understanding is that you can still daisy chain a single monitor and hard drives, just not an additional display. Even with only one external display connected,the poor graphics makes Mission Control and Launchpad sluggish. This is why this little Mac can’t replace your MacBook Pro,unless your needs are light! I was almost going to buy new mac book air and two thunderbolt 27″ monitor. I’m having trouble with Thunderbolt and my MacBook Air 11″. It does not consistently run Target Disk Mode when connected with the Apple T’Bolt cable to my iMac (2.8G i7). When it mounts it is great; but it is really frustrating that mounts only around 50% of the time. I’ve got the mid 2011 Macbook Air connected to a 30″ HD LCD and it’s perfect! I don’t notice lag or anything. If you need 2 huge external displays, then your probably doing video editing or some crazy graphics design. In either case you really shouldn’t use a laptop for this, go with a beastly desktop with the highest possible graphics card. I have 2011 Macbook Air 13″ connected to two 30″ cinema displays, the first via the dual-link DVI thunderbolt cable, and the second running via USB2->DVI. Admittedly the 2nd monitor I have paired down to run at 1280×800 – which is really big, works great for terminals, and does not handle video well. The beauty of being able to work on my computer and then pick it up and still have EVERYTHING available in a portable package really is fantastic.